The BRANSIST safire VC17 ceiling-mounted vascular package is a digital angiography system that features a 17 x 17-inch direct-conversion FPD, the largest in its class. The system offers not only high image quality, but the optimal image quality for the various complex interventional procedures over the extensive field of views available. Through flexible system operation, fast digital image processing, with due consideration given to patient comfort and the latest applications, the system provides an advanced facility for state-of-the-art medical centers. BRANSIST safire VC17 was developed for optimal support of interventional procedures with excellent visibility of fine blood vessels and devices over the entire field of view range. The high-performance flat-panel detector which is based on a revolutionary Direct-Conversation technology achieves enhanced visibility and easily visualizes even the smallest devices which are available today. The large-field-of-view 17 x 17 inch is the largest in its class. By utilizing a 17-inch FOV, a single image can cover the entire abdomen, thorax, or both legs, while also retaining fine resolution of the body part. By using a larger FOV, the system can reduce the number of contrast medium injections, fluoroscopy positioning operations, and relieve the patient burden during procedures. The ceiling-mounted C-arm offers a wide coverage, extending 160 cm laterally and 287 cm longitudinally. This helps in choosing a safe brachial, radial or femoral approach. 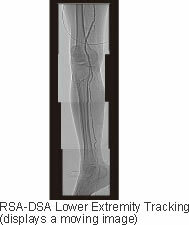 In addition to basic imaging operations, such as multi-display and split display, zoom, measurement and stopwatch, the IVR NEO controller permits accurate control of the overall system from the angiography lab, including setting imaging techniques, switching fluoroscopy modes and recording fluoroscopic images. The new DirectMemory unit intuitively calls up C-arm clinical angles for a patient and allows rapid repositioning. DirectMemory provides powerful support for smooth, stress-free diagnostic catheterization and interventional procedures. BRANSIST safire VC17 features a tableside controller for all C-arm and image operations, offers the ability of switching between fluoroscopy and radiography protocols. This versatile controller offers the operator great east-of-use. INTELLISHIELD allows the FPD to detect the patient and automatically stop C-arm operation, allowing the operator to use the high-speed C-arm with complete confidence. INTELLISHIELD is a contact-avoidance function that uses capacitive sensors embedded around the FPD to automatically stop C-arm operation when the patient is detected. In addition, a touch-type safety sensor is provided at the center of the FPD where detection is difficult. These duplicate safety mechanisms allow the operator to sue the high-speed C-arm with complete confidence. RSM-DSA Chasing is a new application with a multitude of patient benefits since it greatly reduces the amount of contrast medium required, patient does not need to be strapped down, flexible framing is performed in conjunction with contrast medium flow, and patient radiation dose is reduced since a mask run is not required. Useful for preoperative therapy planning and postoperative result judgments, RSM-DSA provides 3D-like detailed information of complex blood vessels and identifies nutrient vessels. Since RSM-DSA is not affected by artifacts caused by bodily or respiratory movements, this feature is superbly suited for contrast examinations during emergencies and for portal veins requiring prolonged breath holding.